Your trip to the doctor can still be deducted even if you finance the costs. 2. Can You Itemize a Registration Sticker on Income Taxes? 3. Do You Get a Refund for Medical Expenses Even If You Didn't Pay Any Taxes? Nobody likes trips to the hospital, and it’s even less enjoyable when you have to pay the medical bills, especially if you have to finance your medical expenses. However, even if you do have to take out a loan or put it on your credit card, that doesn’t disqualify you from claiming the medical expenses deduction. However, you need to follow the rules when claiming the medical expenses deduction. 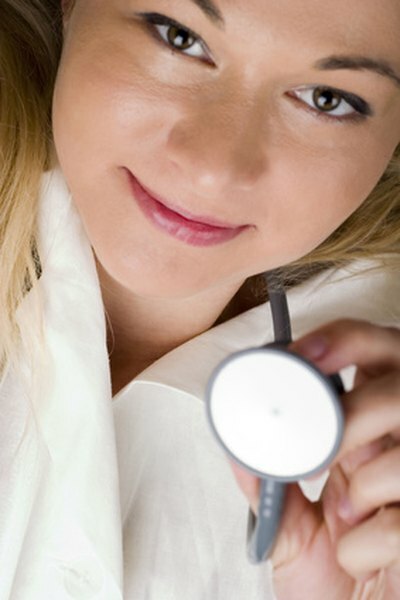 You can deduct your medical expenses you pay during the year, even if you must take out loans to pay them. To count toward your medical expenses deduction, you must pay the medical costs regardless of when the medical services are actually provided. For example, if you finance the medical expenses by paying them with a credit card, you deduct those expenses in the year in which you charge them on your card, not the year that you pay off your credit card. If you took out a loan and then write a check to pay your bills, the year in which you deliver or mail the check is the year that you can deduct the expenses. You can’t deduct all of your medical expenses, including ones you paid for with a loan for hospital bills, on your taxes. Instead, the tax code limits you to deducting only the portion of your medical expenses that exceeds 7.5 percent of your adjusted gross income. For example, if you have an adjusted gross income of $55,000 and $7,000 of medical bills, your deduction is only $2,875. If your medical expenses don’t exceed the threshold, you can’t deduct your expenses. In addition to being limited to claiming only the portion of your medical expenses that surpass the threshold, you must also give up your standard deduction and itemize on your taxes if you want to claim your medical expenses on your taxes. So, if you don’t itemize, you can’t claim any medical expenses. The medical expenses deduction still uses the 7.5 percent adjusted gross income threshold for the 2018 income tax year. However, the standard deduction has increase dramatically in 2018, which will make it less likely that your medical expenses, including ones paid for with loans for medical procedures, will actually increase your tax refund. For 2018, the standard deduction is $12,000 if you’re single, $18,000 if you file as head of household and $24,000 if you’re married filing a joint return. It’s much more likely that you’ll qualify to deduct your medical expenses in the 2017 tax year because even though the adjusted gross income threshold is still 7.5 percent, the standard deductions are much lower. For single filers, the standard deduction is $6,350. For heads of household, the standard deduction is $9,350 and married couples filing jointly have a deduction of $12,700. Can You Get a Tax Deduction for Paying Your Relative's Tuition?